BALDWIN PARK – Baldwin Park Unified’s Kenmore Elementary School is being recognized as a silver medal winner in the 2018 America’s Best Urban Schools competition for its success in serving students from ethnic minority populations and low socio-economic households. To receive the honor, all student demographic groups, including English language learners, at the highly diverse campus had to score above state averages on California’s English language arts and math standardized tests. In all, 18 schools were selected as finalists in the competition; of those, 15 received medals – four gold, six silver and five bronze. Just four California schools were chosen as medal winners. In 2016-17, 91.9 percent of Kenmore’s 540 students received free and reduced-price meals, 28.7 were English learners, 18 percent were homeless and 13.5 percent had disabilities. Overall, 55.56 percent of students met or exceeded proficiency standards on the state English language arts exam and 47.02 percent did so on the math exam – both scores topping state averages by at least 7 percentage points. In 2015-16, 68 percent of students tested as proficient on the state science test. Kenmore provides access to two computer labs and 13 class sets of Chromebook laptops. Curriculum is driven by the rigorous California Standards. Teachers are trained in instructional techniques that include Thinking Maps, Write from the Beginning and Beyond, close reading, shared inquiry and cognitively guided instruction – all designed to foster creativity, communication, collaboration and critical thinking. The school also promotes a college-going culture as part of the No Excuses University network, emphasizes positive discipline programs, rewards students for reading challenges and encourages students setting their own goals. In spring, Kenmore was named a California Distinguished School – the state’s top honor for high-achieving schools. Just 287 of more than 5,800 elementary schools received the recognition. In 2016, Kenmore was awarded a California Gold Ribbon for its literacy integration program and praised as one of six U.S. models of success by the No Excuses University network. BPUSD_KENMORE_1: Baldwin Park Unified teachers and administrators celebrate Kenmore Elementary School’s silver medal in the 2018 America’s Best Urban Schools competition. The award was given Oct. 9 at a gathering held by the National Center for Urban School Transformation in San Diego. Baldwin Park Unified teachers and administrators celebrate Kenmore Elementary School’s silver medal in the 2018 America’s Best Urban Schools competition. 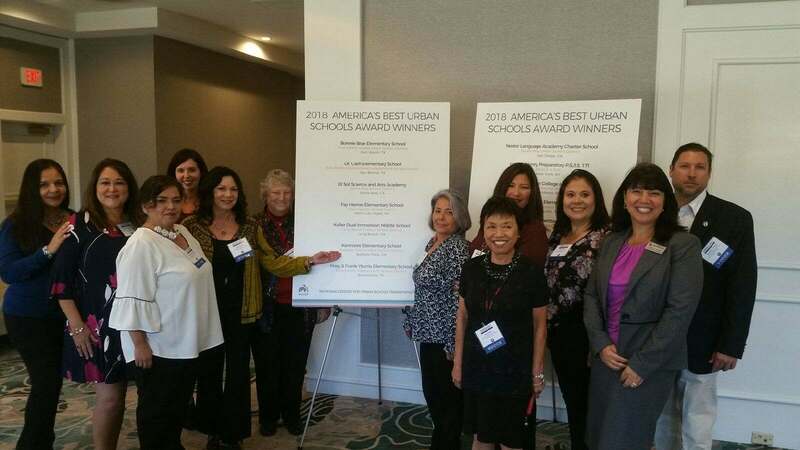 The award was given Oct. 9 at a gathering held by the National Center for Urban School Transformation in San Diego.